And so much of the shared happiness I was a part of this year centered on a purse. 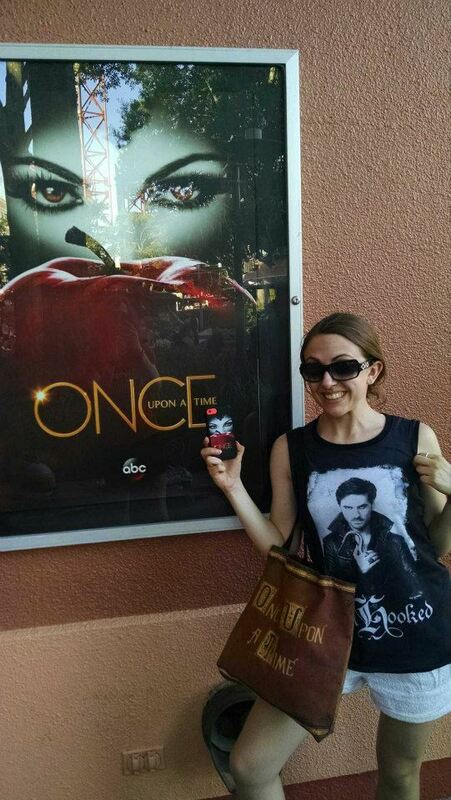 I was basically a walking advertisement for Once Upon a Time on this trip. ABC should be paying me at this point. When I bought a Once Upon a Time bag online before my Disney trip, I was hoping maybe a few people would recognize it. Little did I know that it would serve as a major conversation piece pretty much everywhere I went. 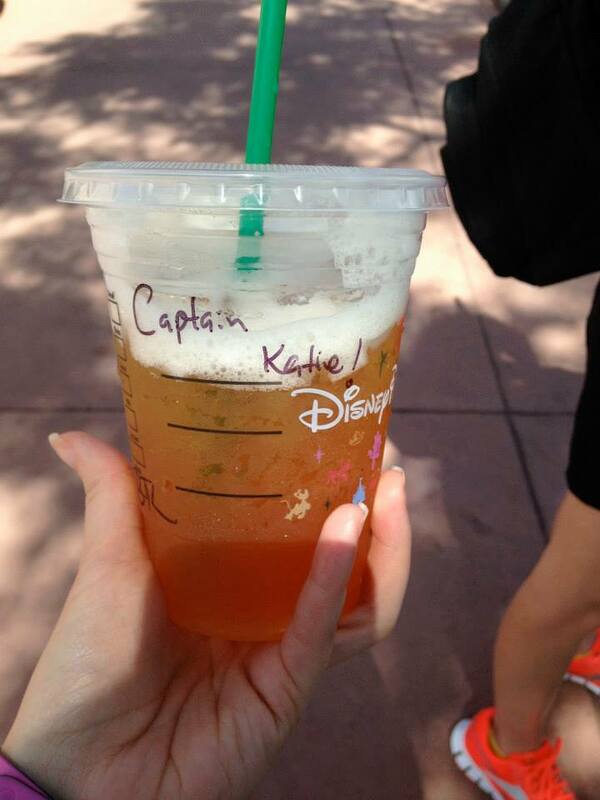 And when I paired it with my Captain Hook tank top one day, my ensemble was the source of plenty of smiles and even a very fun shout-out from the barista at the EPCOT Starbucks. I loved that even the Cast Members got in on the OUAT fun! I’ve never been a part of so many positive encounters with fellows fans (at least in-person) as I was during this trip while carrying that Once Upon a Time bag. Teenage girls stopped me to tell me how much they love the show. Young women my age let themselves give in to their nerdy sides and gush about it. Mothers and fathers talked about how much their kids enjoy it. One cast members stopped me to talk about their love for Hook; another showed me some fan art they drew of Regina teaching Emma magic. Nearly every day (and honestly more times than I can remember on the day I went to Star Wars Weekends—the most nerdy day of them all), at least one person stopped me to tell me not just how much they loved my bag, but also how much they loved the show it was referencing. Every single one of these encounters was a shining example of what fandom should be—and what it can be when we choose to focus on what we love instead of wasting energy bashing what we feel negatively about. Before leaving for WDW, I was feeling pretty down about fandom and its increasing levels of vitriol. It seemed to me that many fandoms I engaged with were getting torn apart by “ship wars,” arguments about liking one actor or character over another, and fights about the future of their respective shows. It made me sad to see what should be a source of happiness for people turned in to an environment of harsh negativity. In short, I needed a break. And as it turned out, my break turned out to be exactly what I needed to feel better about the state of fandom and my place in it. I’m sure every fan I interacted with during my trip—Oncers, Star Wars fans, Disnerds, etc.—all had different favorite characters, different favorite relationships, and different reasons why they love what they love. And that’s a good thing. But at the end of the day, what mattered wasn’t whether someone likes Sith more than Jedi or ships Swan Queen rather than Captain Swan; what mattered was our shared love for pieces of media and the characters in them that move us, inspire us, and bring us joy. Focusing on what we share as fellow fans is much more fulfilling than focusing on what “side” of a particular fandom debate we’re on. I think that’s easier to do in person, when you’re face-to-face with a real human being who’s sharing their enthusiasm with you. On the Internet, sometimes it can be harder to remember that there are real people behind their usernames and avatars. But that doesn’t mean we shouldn’t always try to remember that above all other things when it comes to interacting with fellow fans online. It costs nothing to be kind to another person, and it can truly make someone’s day to reach out to them in a positive way about the things they’re passionate about. After my WDW adventures, I’ve returned with a renewed sense of hope and purpose. And I believe the most important thing I can do through NGN (and the book I’m hoping all of you are writing your letters for!) is to continue to give my fellow fans a place to be enthusiastic and unashamedly passionate about what they love. I’m always looking for ways to keep feeding my Disney Side long after I return home, and I can’t think of a better way to do that than encouraging people to find the fun and embrace the joy in the world of fandom. Let it never be said that I don’t know how to have fun with fandom. 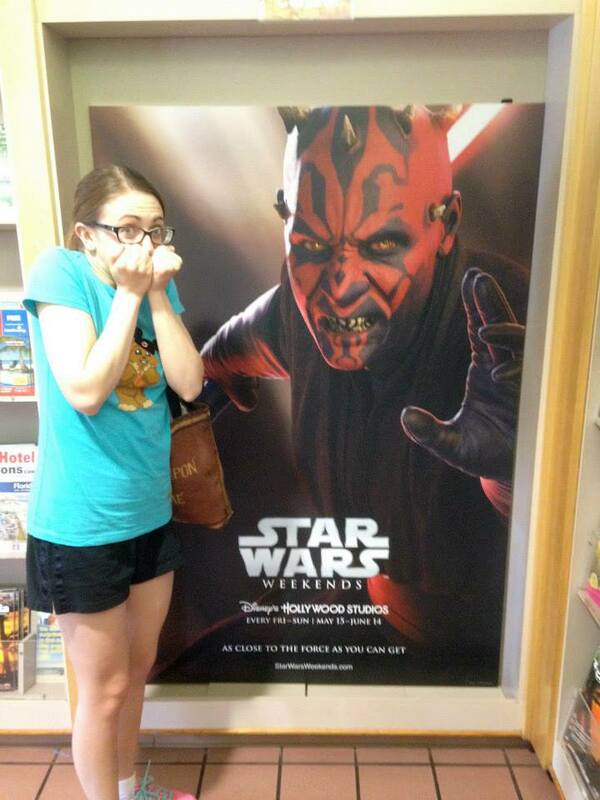 This entry was posted in Disney, Travel and tagged disney, nerd musings, travel by Katie. Bookmark the permalink. It costs nothing to be kind to another person, and it can truly make someone’s day to reach out to them in a positive way about the things they’re passionate about. I love this line the best and I know the feeling about negative fandom activity ruining your enjoyment of this beautiful show we all love. Frankly, I’ve never understood ranting and ranting negative things when you can spend your positive energy talking about what you love. I mean, there’s a big difference between constructive criticism and downright hate and bullying. I like to think whenever I write metas about this show, if there’s something negative in it, I try to make it more constructive criticism than just plan ranting. I’m glad you had a wonderful time at WDW and so many fans recognized your hand bag and fangirled or fan boyed about it. I completely agree with you about choosing to spend your energy on constructive rather than destructive writing and discussion about a show. I always feel like positivity is a much better use of my time and energy; being negative only leaves me feeling drained. It’s always nice to know others feel the same way. It sounds like you had a great time. What a lovely break from everyday life and fandom nonsense. I’m sure there were probably a few people who saw your bag and thought “ugh, I hate that show” but in real life you don’t waste your energy going up to someone and saying something negative. It’s awkward and pointless and isn’t worth a person’s time. If only the internet worked the same way! Ignore the stuff that doesn’t appeal, celebrate what you love. There’s no need for people to come into your space to correct you on what you love or how you view the show. It makes me sad that running this blog (doing this positive thing that you love) opens you up to negativity and bullying. I like to hide in my little bubble and ignore Twitter and the trolls, but you can’t do that and also share this love for your shows here. It’s very frustrating. But hopefully the excited happy positive voices will drown out the trolls and maybe eventually they will just go away. And btw, I’m going to remind my friends about writing their letters for your book. I wonder if you could post a little reminder here and there on Fb or the blog, just to keep it fresh in people’s minds. I know some of my friends were waiting for school to be done before they could start. I know it isn’t fun to feel like you’re harassing people to follow through, but I’m afraid some people need that! I think you hit the nail on the head when you said that people would never walk up to someone in person and say something negative or hurtful about something the other person clearly loves (or maybe I’m giving people too much credit). But on the Internet, there’s often a sense of at least one party failing to recognize the humanity in the other party. I wish more people could remember that there are real people behind every keyboard. And honestly, I’m one of the lucky ones when it comes to my commenters and the stuff said about me on social media. For every bully or jerk, there’s 50 wonderful people saying positive things. I just need to remember to focus on those wonderful people instead of the small minority of people who aren’t worth my time or energy. I love that you got to meet so many other people that are so enthusiastic about fandom, especially OUaT. When you’re in a fandom, it gets easy to be caught up in the drama. Even if you’re not perpetuating it, it’s a constantly lurking presence that can easily start to erode your love for a show or movie. It makes you guarded and concerned that someone will try to use something that means so much to you against you. Ideally, that wouldn’t happen and we’d all just naturally ignore those who would try to bring us down, but that’s not always what happens. That’s what makes NGN such an important space to me. It is a space that is designed to be enthusiastic about what you love, no matter what that may be. It’s about being respectful of others views and finding some like-minded people to share your own with. It is a space centered around positivity and finding the things you love about something rather than all the things you dislike. I’m so glad you were able to reconnect with this side of fandom on your trip and can’t wait for the fun summer ahead as you share more of your thank you letters with us! “Even if you’re not perpetuating it, it’s a constantly lurking presence that can easily start to erode your love for a show or movie. It makes you guarded and concerned that someone will try to use something that means so much to you against you.” – This is EXACTLY what was happening with me right before I left for Disney. Even when I was trying my hardest to stay away from the drama, it somehow found its way onto NGN, and that bothered me a lot. So it was nice to get away from all of that and reconnect with the things I have always championed about fandom: the connection, the joy, and the shared love. First and foremost I am so glad you’re back and rejuvenated. I was never a Disnerd per say and prior to my daughter had only been to Disney World once. If anyone had asked me if I’d make three trips inside of 5 years I would have laughed. 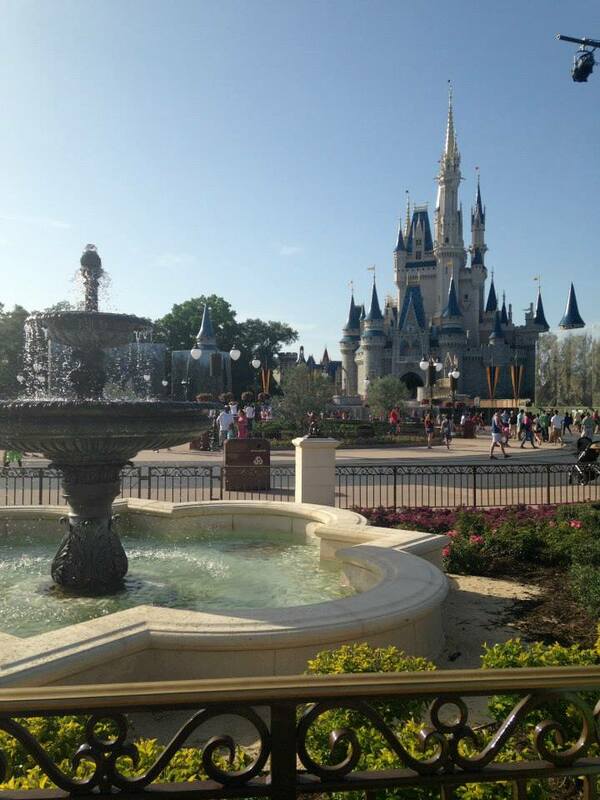 But there is something special when you are open to the experience that Disney World can bring. There is not only joy, but an innate kindness that you can experience there if you are simply willing to believe. That’s not to say everyone goes with that attitude, but man are they outnumbered. I experienced a lot of what you did when we were there for Halloween. People delighting in the things that brought them joy. My daughter and I having fun with the photographers around the green screen and animation effects for pictures around the parks. And people just reveling in the things that tickled them with joy. It’s infectious if you are open to it. I am happy that my fan experiences are based in face to face contacts — sports arenas, concerts and theater. Before the internet I knew that being a fan was sharing joy at its very core. As recently as two weeks ago I was standing amongst 2,000 fellow fans at a Prince concert when Stevie Wonder walked on stage. The electric response that errupted in that moment was in an instant bonding and unified. Strangers high fiving and hugging (much like a playoff game of a favorite team). We were all connected in joy. That was the through line and it was exhilirating. I think the technology that extends fandoms beyond my immagination also can limit those who don’t have the three dimension experience. I watch my own child go giddy when she discovers someone is a fan of OUAT (I can not wait to watch you two compare notes!). She craves the common experience when it is shared with other people, because even at 9 she innately understands that joy requires oxygen and expression as much as it feeds on passion and belief. I relish a good debate as much as I do a good kismet connection, because they both drive from a giddy passion, induce endorphins and build on a shared experience and at the end of the day – isn’t that what this life is about – discovering shared experiences that are born from joy. I think growing up around sports fans and being one myself definitely helped foster my understanding of fandom as sharing things with other people. Yes, sometimes sports fans can be jerks to each other’s faces, but for the most part, my experiences were (and still are) ones of both shared joy and shared sorrow rather than anything openly divisive. My grandparents would take me to Disney when I was younger. (I haven’t been in a while — I must admit, I’m a little jealous of your trip. However, I will tuck it away so that I won’t ruin the nice vibe we have going. I will NOT turn green. I will NOT turn green. I will NOT turn green.) We’d sing along with the songs on the rides. You know you’re getting a little loud when the Australians start giving you the side-eye. Blocking the negativity is HARD. (I know as a teacher I’ll fixate and obsess over that one negative, badly written eval.) It’s especially difficult with writing because it’s so intensely personal. Let me add my thanks for providing a thoughtful and fun place to hang and discuss. I appreciate both the thoughtfulness and the joy. This isn’t just mindless fangirling. We fangirl with our MINDS here. Renewed hope: Snow White would be so proud. “Snow White would be proud” is one of the highest compliments I can be given, so thanks for that. 😉 And thank you for saying such kind things about NGN. Yay vacations! I always watch with envy every year when you take your trip to WDW. It looks like such a fun time, and it seems like there is an unlimited number of things to do! Disneyland is great, but much less ambitious in size for sure. I hope I get the chance to experience WDW at least once in my life! I also loved hearing about the enthusiasm of the other OUaT fans you met on your trip! Wearing your passion for something is an easy way to make yourself accessible to conversation and a connection with another person. I know I am quite looking forward to wearing my Mulder and Scully shirt downtown during comic con and seeing the reaction from people. Even at large conventions people tend to be pretty welcoming about their passions (even with high intensity). Heck, a few months ago a kid at the grocery store was basically stalking me once he saw my STAR labs sweatshirt. Its also why I try to wear a geeky shirt in my beer vlogs. Its a way to show people a little bit of who I am without having to actually talk about it directly, while also providing the opportunity for others to talk to me about it if they want to. I hope I myself can get over a little bit of my own writers block and finish this Lois Lane essay for your book! Its going to take a good chunk of courage to finally hit the send button, but it will happen! If you need encouragement for your letter, I’m here to cheer you on. It definitely takes a lot of courage (I’m kind of freaking out over the one I want to finish for tomorrow), and that makes me feel so honored that people are being brave enough to share those letters with me.